Tsuki turned seven with her best floral kimono, a delicate pink crown, a lovely cream filled cake, surrounded by lanterns amongst the trees and rocks and of course her sisters, Aki and Hozuki. It is almost all that she wished for. The one missing wish...her sobo. They say that if you miss someone, set a lantern to the sky and let it fly. Then, make a wish upon it and they will hear you. 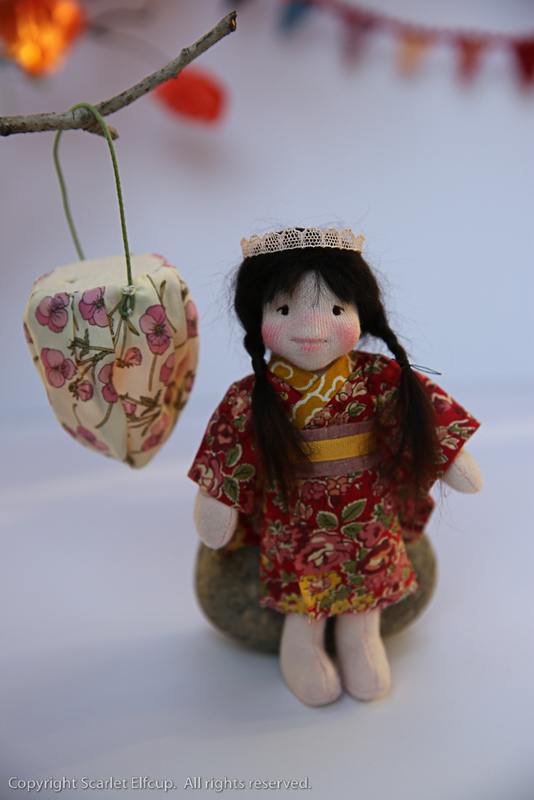 Tsuki was created for a special little girl who lives in Japan and whose 7th birthday is coming up. Her birthday coincides close to the Mid-Autumn Festival (or Moon Festival) which is celebrated by many Southeast Asian countries and originating mainly from Vietnam and China. In 2016, the Mid-Autumn Festival was on September 15. During the festivals, thousands of lanterns are set ablaze floating upward into the moonlit night sky or downward into the ebb of a moonlit river. 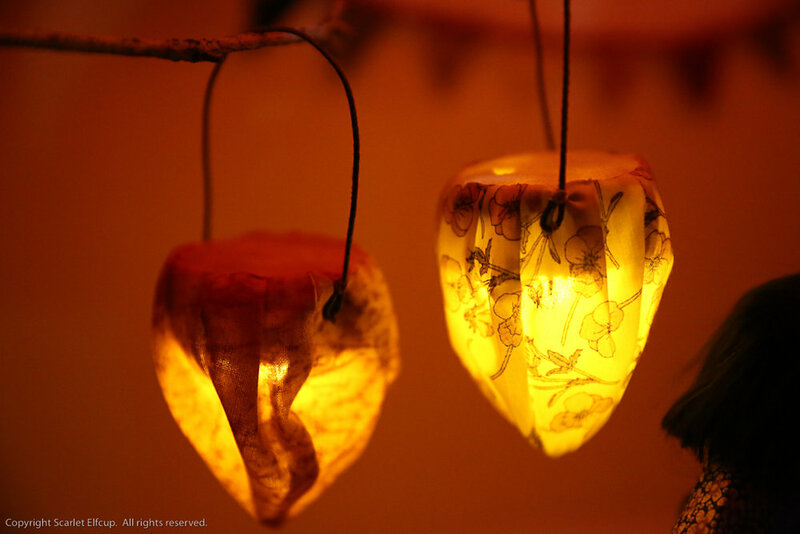 Traditionally, lanterns signified wishes for health, harmony or longevity. Lantern festivities are a sight to behold and I do dare to dream that one day, I will travel with my children back to my homeland country of Vietnam and experience this magical event with them. 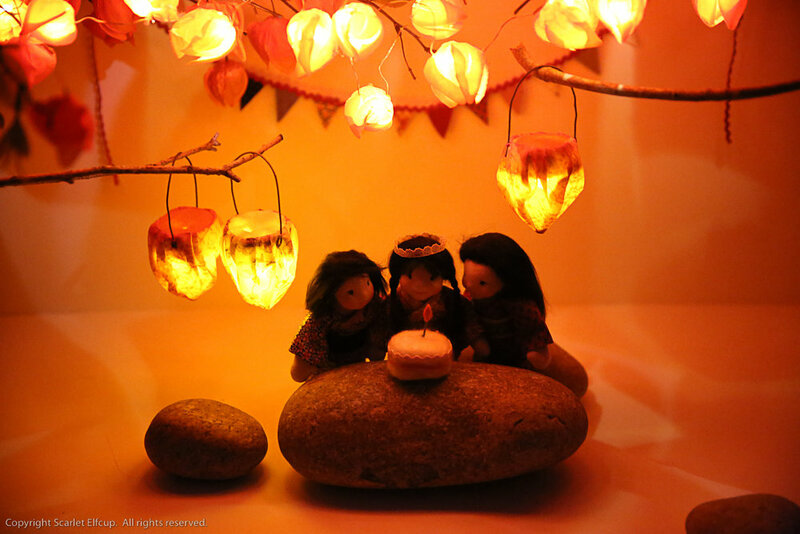 Tsuki's birthday celebration with sisters Aki and Hozuki and lanterns lit in a secret garden filled with physalis alkekengi (Japanese lantern plant, hozuki) was inspired by the Mid-Autumn Festival. Tsuki is a 6" Wee-Bee Mini Elfcup. She is made from 100% cotton interlock. Her dark soft locks are made of wefted 100% suri alpaca and braided into two braids secured with thread. Her eyes and lips are embroidered with 100% cotton floss. Her cheeks, lips, nose and various body parts are blushed with 100% red beeswax. Tsuki comes wearing a wee-tiny kimono made with 100% Liberty of London cotton and 100% cotton bias at the neckline. The kimono is wrapped at the waist with an obi made from 100% linen and cotton. The obi is secured with two nickel-plated brass snap buttons on the back. Underneath, she wears a set of matching bloomers made of 100% Liberty of London cotton. Tsuki's head is graced with a birthday crown made of 100% French cotton lace. On her feet, Tsuki wears a simple hand crocheted pair of sandals made from a hand-dyed Kakishibu 100% silk yarn. Tsuki comes bearing a few birthday trinkets. Her delicious cream birthday cake is needle felted from 100% wool roving, decorated with pink ric-rac and topped with a candle made from wire wrapped in thread glowing with a flame made from 100% Belgian wool felt. For her party decor, she carries a birthday bunting made with bits of 100% cotton and 100% Belgian wool felt secured to red ric-rac. Lastly, and most importantly, she carries a special birthday lantern...for making wishes come true. Her lantern is made from 100% Liberty of London cotton. Lighting the lantern from inside is a brand new, tea light wrapped very securely in 100% cotton fabric and 100% Belgian wool felt. A tiny opening is left at the top of the lantern to switch it on and off. 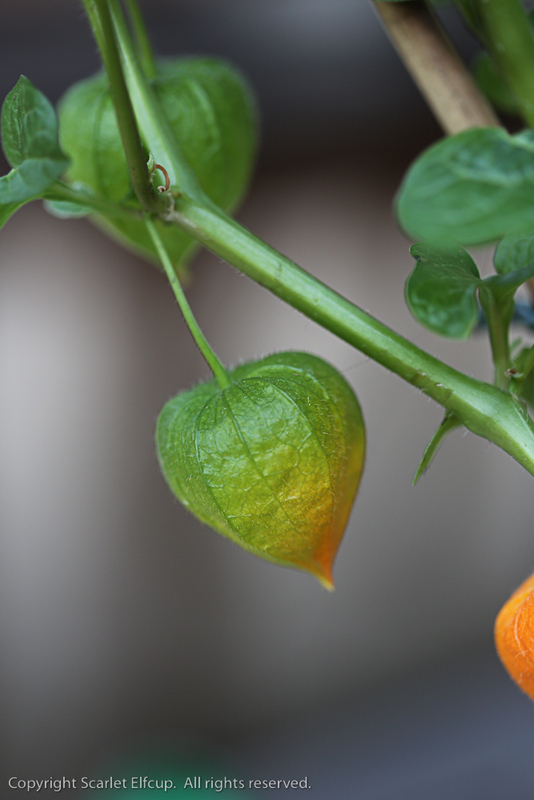 The lantern design was inspired by the physalis alkekengi itself. Tsuki's lantern is especially wrapped in a floral Liberty with pink flowers for pink is her signature color. For a grand daughter and her grandmother...over seas and over oceans, may not distance or time hold apart your hearts. Happy happy birthday, dear little E!